Switzerland won the Central European Development League ODI Tri-Nation Series in Warsaw with wins over fellow visitors Czech Republic on Friday 3rd July & against the hosts on Sunday 5th July 2015. All matches were played at the new Polish Cricket ground, Gminny Ośrodek Sportu i Rekreacji, situated about 15kms from Warsaw city centre in Stare Babice, from Friday 3rd to Sunday 5th July. From the verge of defeat, Switzerland's Nasir Mahmood and Vaibhav Singh put on a 100 partnership to beat Czech Republic by 1 wicket. 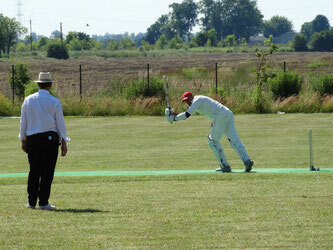 On a glorious sunny day at Warsaw's new cricket ground, Gminny Ośrodek Sportu i Rekreacji, situated about 15kms from Warsaw city centre at Stare Babice, Switzerland's captain Afzaal Sikander won the toss and put the Czech team into bat. The Czech's played a very patient and mature game, each batsman contributing to a good score of 216 ao, just two overs short of their allotted 50. Switzerland began well, but they lost the first of their openers in the second over, just two overs later, losing the second. This trend was to continue as Switzerland, although 8-10 overs ahead of the run-rate at every stage of the game, continuously lost wickets and at 117-9 after just 26 overs, even the umpires could be forgiven for thinking that an early beer was inevitable. However, the 10th wicket partnership of Nasir Mahmood (54*) and Vaibhav Singh (30*) had other ideas. They batted for 19.3 overs and accumulated 100 runs exactly as the 10th wicket parnership took Switzerland across the winning line, 4.3 overs before the allotted 50 overs. On the second day of the tournament the Swiss were treated to day off and an opportunity to visit the city of Warsaw, while Poland and the Czech Republic battled it out on another scorching sunny day at Gminny Ośrodek. The Czechs were put in to bat by the hosts, this time setting a target of just over 5 an over of 253-9 in their allotted 50. Things started badly for Poland, their number 2 opening bat dismissed for a diamond duck on the first ball of the game and seconds later losing their second wicket, Poland were 2-1 off just the fisrt 6 balls. The ship was steadied by the middle order, but a tail-order collapse left Poland fell well short of the required total, 82 runs short in fact, dismissed for 171 in 41.3 overs handing the Czechs a 82 run victory. Switzerland had to win the final game in order to win the tournament, the Poles could only achieve this on Net Run Rate. Switzerland lost the toss were to put into bat. The Swiss started well and it took until the first drinks break before Poland got the first break through (55-1), just a few overs later the second (68-2), both bowled. Winterthur's Tom Mampilly (73) led the Swiss to 104-3, until a mid-oder collapse put Poland firmly back in to the driving seat (132-6). The Swiss continued to add to the total but lost wickets at regular intervals and eventually ended their innings 8 overs short of thier 50 on 203ao. Before the second innings began it was established that the Polish team had to reach the Swiss total in just over 22 overs in order to win the tournament on Net Run Rate. 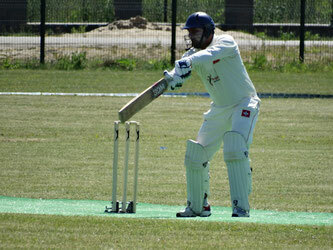 Poland quickly got to work with some agressive batting but the needed wicket did come in the 5th over (28-1). At 35-2 there might have been some doubt whether they could reach the total, but the Polish confidence was restored. 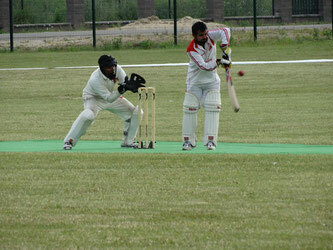 Poland lost more wickets either side of the drinks break at 69-3 and 74-4. The game was in the balance as the score reached 82-5, just one over later. Despite the Polish middle order standing up well, at 108-6 after 16 overs, they were unable to keep up with an ever increasing run rate. Poland realised this and appeared to abandon the plan to win the tournament and instead concentrate to winning the game. At 157-7 anything was possible, but the tail wasn't able to wag sufficiently to win the game, Poland eventually all out 19 runs short of the total at 184ao, albeit after only 36.5 overs, Tom Mampilly stumoing the Polish number 11 off a wide delivery. 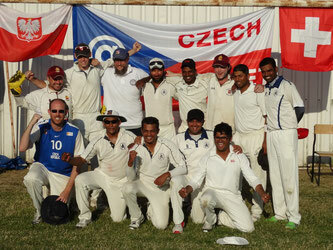 You can also view photos of the Central European ODI Tri-Nation series. and read Dan Casey's article on the Cricket Europe website or Miram's Lodge account of the weekend in a German language version.